2 What Helps Lower Cholesterol Levels? 3.1 Why is “good” cholesterol good and also “bad” cholesterol bad? 4 B Vitamin Helps Lower Cholesterol? High levels of cholesterol are precursors to dangerous heart disease, stroke, and heart attack. Cholesterol drugs can be essential for managing your high cholesterol and improving your cholesterol ratio, and there are many available on the market. These drugs are considered cholesterol reducing drugs. Based on the type of cholesterol problem that you have, and how long you have been dealing with this problem, your doctor can prescribe cholesterol drugs that can improve your condition. Cholesterol lowering drugs are typically only prescribed if lifestyle and nutritional alterations to the diet are not sufficient to reduce the overall level of cholesterol, as determined by a blood serum cholesterol test. However, it should be noted that not all medications are created equal and that not all medications work for each individual. That is why it is essential to discuss your options with your doctor – and also research the many options available today so that you can be a more informed partner in your cholesterol management. There are two main types of cholesterol-lowering drugs available. The first type is called statins, which is a type of drug that prevents the body from creating cholesterol. Statins are used to decrease the amount of low-density lipoprotein or LDL cholesterol, which is the “bad” kind of cholesterol. Statins can also help to reduce triglycerides and raise the high-density lipoprotein or HDL cholesterol. Statins are generally safe and have few side effects. However, if you have liver problems then statins are not ideal for you. The second type of drugs for lowering cholesterol is called non-statin drugs. There are several drugs in this class includes cholesterol absorption inhibitors, resins, fibrates, and niacin. Selective cholesterol absorption inhibitors are drugs that prevent cholesterol from being absorbed in the intestines, and it also allows the body to properly dispose of the cholesterol through an increase in bile production. Again, this type of drug may not be ideal for those suffering from liver conditions as the drug partly acts on the liver to increase bile. Fibrates are ideal for decreasing triglycerides. Some fibrates can help to increase HDL, which is the good cholesterol. Unfortunately, fibrates are not indicated for lowering LDL, which is the bad cholesterol. Sometimes fibrates can be utilized in conjunction with statin drugs for a combination of utility to combat high cholesterol associated with high triglycerides. Fibrates are a new cholesterol drug. Niacin, which is also known as vitamin B3, is something that can be prescribed to help lower triglycerides, increase HDL and decrease LDL. Niacin does have side effects, particularly in large doses which are only found in the prescription form. Prescription niacin is considered a non statin cholesterol lowering drug. It is oftentimes the case that one cholesterol lowering medication may not work for every individual, or that your doctor may need to adjust the level of your medication throughout the course of treatment. It is ideal to work with your doctor on the choice of medications as your doctor knows best based on your medical history. Be aware that all medications have side-effects and not all medications may be right for your situation. Additionally, it is your responsibility as a patient to make certain that your doctor or other healthcare provider is aware of any other medications you are taking, including any supplements, because many medications and supplements may interact with cholesterol drugs. Likewise, it is also important to check with your doctor if you wish to begin herbs or vitamins, as these can also interact with cholesterol drugs and can possibly interfere with their effectiveness. 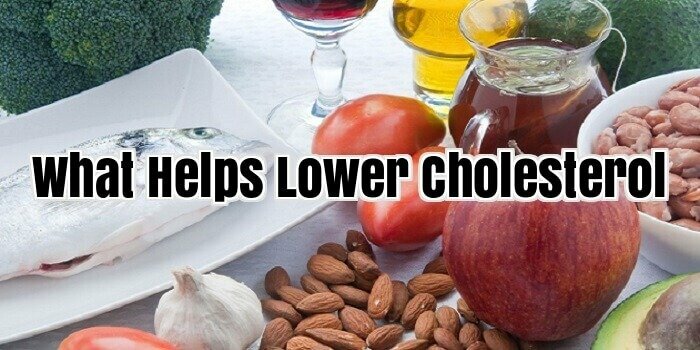 What Helps Lower Cholesterol Levels? Knowing your cholesterol levels will help you determine the best method that will help lower cholesterol levels. The only way to know your cholesterol levels is by taking blood test since there are no symptoms for high cholesterol. Adults within the age of 20 years and above are supposed to have their cholesterol levels tested at least once in every five years. Your heart risk factors also determine the best cholesterol lowering method for you; for those with high risk factors, a combination of more than one method including medication will be the best way to lower cholesterol levels. Healthy low cholesterol diet is one way that helps lower cholesterol levels. A healthy diet includes more of mono and polyunsaturated fats, lots of fibre and omega 3 fatty acids. You can get these foods by eating lots of vegetables, plenty of fruits, nuts and seeds such as almond, walnuts, peanuts and cashew nuts, cold water fish such as trout, mackerel, herring, sardines, salmon and tuna. Reducing your intake of saturated fats and trans-fats will also help in lowering cholesterol levels. Saturated fats are mostly from dairy products and can be replaced with plants oil such as olive oil, canola oil, sunflower oil and safflower oil. Another way that helps lower cholesterol levels is doing a lot of physical exercises. You do not necessarily have to do difficult exercises, simple exercises like walking, swimming and running can help you in reducing your body weight and hence boost your HDL cholesterol which in turn helps in clearing LDL cholesterol from the blood streams. If you can make doing exercises for 30 to 60 minutes per day the better but if you cannot afford that, you can start by at least 10minutes until you get used to exercising for longer periods. Change of lifestyle is another way that helps lower cholesterol levels significantly. The lifestyle changes that you need to take in your life include doing away with sedentary life and start being active. If you have nothing to do, you can at least try to take a walk just to make sure you are not spending your day inactive. If you are a smoker, you need to quit smoking as it increase your cholesterol levels as well as damaging your liver. You should also train yourself to drink alcohol moderately other than excessively; excess consumption of alcohol increases you triglycerides levels while moderate drinking boosts your HDL cholesterol. Medication helps lower cholesterol especially in people with higher heart disease risk factors. Medication can also be used hand in hand with other methods although you are supposed to use it if you note that other methods are not working on you. Medication should also be used with a doctor’s prescription as he or she will know which the best one for you is. The available medicines that help in lowering cholesterol include statins, which lower triglycerides and LDL cholesterol and at the same time elevate HDL cholesterol levels. Bile acid and fibrates are another good type of medicine used to lower cholesterol levels. Niacin is used to increase the good cholesterol, HDL and therefore lower the bad cholesterol indirectly. Most of us realize that our diet may trigger high serum cholesterol and triglycerides, yet do you know you may lower your bad (LDL) cholesterol as well as bolster your good (HDL) cholesterol by having easy dietary modifications? Cholesterol is vital when it comes to life and health. Cholesterol is without a doubt an essential element for the creation of bodily hormones, bile acids, cell membrane layers, as well as Vitamin D. Cholesterol is mainly produced inside the intestines, liver, adrenals, ovaries, as well as testes and a portion is additionally come from the dieting. However, excessive bad cholesterol blended with inflammation may enhance our likelihood for heart disease. Why is “good” cholesterol good and also “bad” cholesterol bad? There are actually 2 basic kinds of cholesterol. LDL (low-density cholesterol) that is typically referred to as “bad” and HDL (high-density cholesterol) typically referred to as “good”. The bad cholesterol stimulates excess fat in the blood stream whereas the good cholesterol eliminates unwanted LDL cholesterol and also triglycerides from the blood stream thereby safeguarding our cardiovascular system health. The higher the LDL to HDL correlation the higher the threat for the development of atherosclerosis: the hardening as well as clogging regarding the arteries that raises the danger of heart attack. Modifying your diet regimen to lower your bad cholesterol levels is the best strategy. Medications may have long-lasting adverse effects whereas developing long-lasting healthy way of life and dietary modifications are going to lower your bad cholesterol yet will additionally boost your general health, decrease your threat for cancer, decrease your likelihood for stroke, cardiovascular disease and a lot more. Vegetables and fruits aid decrease LDL cholesterol, especially useful are avocados, berries, cabbage family, onions, apples, pears, garlic, dark leafy greens and also eggplant. Vegetables and fruits consist of high amounts of antioxidants which safeguard the distributing cholesterol from oxidizing that is when it ends up being especially hazardous. Vegetables and fruits additionally consist of soluble fibre as well as phyto-sterols. Foods abundant in phyto-sterol bind with cholesterol inside the intestines and decrease the absorption of LDL cholesterol. Phyto-sterols resemble cholesterol when it comes to structure and also possess a cardiovascular preventive effect. Add phyto-sterols abundant foods items like nuts that involve pistachios, walnuts, almonds, and macadamias; seeds including pumpkin, sesame, sunflower seeds, and flaxseed, avocados; and also cold-pressed oils like sesame, pumpkin, sunflower, flax, and olive oil. Soluble fibre is especially beneficial when it comes to lowering cholesterol intake within the intestine. Good sources for soluble fibre are barley, squash, carrots, psyllium husks, china seeds, flaxseeds, peas, legumes, oats, cabbage family vegetables as well as pectin containing fruits like strawberries, grapes, apple, and citrus fruits. Soluble fibre is actually still present in fresh juices. HDL cholesterol increases whenever we take in extra essential fatty acid food items including oily walnuts, flaxseed, fish, and chia seeds. Excessive saturated fat may escalate your cholesterol levels and so may consume way too much sugar as well as refined carbohydrate since these are actually converted into saturated fat. Stay away from full fat dairy products, fatty meat products, sugar loaded meals as well as refined white carbohydrates in excess. Trans-fats enhance bad cholesterol, decrease good cholesterol, rise clotting factors as well as stimulate inflammation, granting it the greatest harmful outcome regarding your heart health. These are discovered on refined food items such as oily fast foods, margarine, prepared vegetable oils as well as any kind of baked products having hydrogenated vegetable oil, in part hydrogenated vegetable oil or even veggie fat including cakes, pastries, as well as biscuits. Unwanted body weight increases hazardous LDL and inactivity presses down protective HDL. Reduce weight when needed and also working out more. Whenever our bodies are under stress, we usually produce even more bad cholesterol. Decrease your stress by doing some relaxing activities such as gardening, reading your favourite books, jogging or even doing yoga. B Vitamin Helps Lower Cholesterol? Niacin, otherwise known as B vitamin, helps lower cholesterol while raising good cholesterol (HDL). Because it does both, Vitamin B is highly beneficial for individuals seeking to establish healthy cholesterol levels. Though usually obtained through diet, niacin levels that are low may prevent individuals from reaching an optimum cholesterol level. Niacin provides substantial benefits for those with high cholesterol. Unbeknownst to many, B vitamin helps lower cholesterol naturally while raising the level of good cholesterol found in the body. Niacin is one of nature’s solutions to high levels of bad cholesterol. Additionally, niacin is also used to treat those with a B vitamin deficiency. B vitamin helps lower cholesterol and raise good cholesterol, a quality not found in any prescription medication. Though B vitamin is available in supplements, eating foods rich in B vitamin results in higher nutrient intake through better absorption. Adult men need approximately 16 milligrams of niacin per day, while women need slightly less, at 14 milligrams. The following foods have been shown to contain significant amounts of niacin. Spirulina – Also known as seaweed, Spirulina has the highest concentration of niacin when compared to any other vegetable. Sushi and miso soup contain a good amount of seaweed, though it can also be eaten by itself. Potatoes – Both white and sweet potatoes are high in niacin, one of the main ways most Americans receive their minimum daily intake of niacin per day. Squash – Butternut squash, winter squash and pumpkins are all packed with niacin. Okra, Corn and Peas – Though they contain less niacin than other vegetables, okra, corn and peas are still a good source of this nutrient. Fortified Grains – Many grains are fortified with niacin. Look for breads and cereals that list niacin-fortified grains as an ingredient. Lean Meats – Chicken, fish and steak generally provide a decent source of niacin, though it’s important to choose lean cuts.